Liza Shaw is a chef. She had her own Italian restaurant, Merigan Sub Shop. 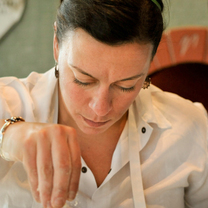 Before she ventured off on her own, she worked at A16, allowing her to grow as a chef: she started at the salad station, then sous chef, then chef de cuisine and finally Executive Chef/Partner in 2009. After leaving A16, her experience there gave her the opportunity to travel and consult while pondering her next move. Our new partnership with Columbus Craft Meats. "Quick jaunt to Portland to see my bud @micuccigrocery on the way out of town and ended sweetly with a pretty great sfogliatelle." "First lobster roll did not disappoint"
"Nothing better on this cold day. Thanks for coming to my neighborhood @namustonepot !" "Bonci at the train station. Brilliant! Thanks for the tip, @chris_behr !"